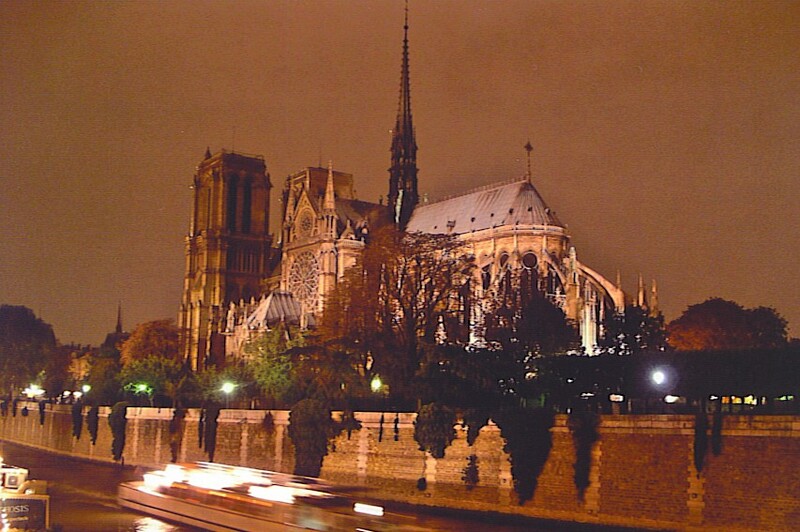 Paris provokes passionate feelings. Visitors to the “City of Light” either love it or hate it; I’ve never encountered any traveler who, having been there, is indifferent to it. I happen to be among those who love it, for lots of reasons: abundant art and great food are just a couple of them. And contrary to the haughty or rude Parisians that some visitors seem to have encountered, we’ve found the vast majority of French people to be charming. For dinner we went to Rôtisserie du Beaujolais. It is owned by the same guy who operates the renowned Tour d’Argent, which is practically next door. The food here was excellent; Sally’s opener was something listed on the menu as Fondue de tomat et basiliac. It looked like stewed tomatoes, but she said it was fabulous. We both had roasted chicken with puréed potatoes (mashed and then put under the broiler) — they were probably the best I’ve ever had. Punctually at 8:00 we presented ourselves at a restaurant called La Rôtisserie du Beaujolais. In 1997 we had eaten there and had loved their mashed potatoes. Sally mentioned that to the captain; in fact she went on quite a bit about how wonderful they were, and how we had talked about their mashed potatoes (purée de pommes de terre) ever since. He was clearly pleased by her effusive compliments. She had some sort of leek salad as her entrée; I had French Onion soup. Then, when Sally’s plat arrived, the chicken was served as a side dish, and an enormous portion of mashed potatoes — at least double the usual serving — was set in front of her as though it was the main dish. Sally exclaimed her delight, and the captain grinned broadly. One of our servers was under the mistaken impression that we were French speakers (indeed, we were the only English speakers in the place). He stopped by frequently to joke with us in French, so we laughed heartily, and, we hoped, appropriately. A cat wandered through the restaurant hoping for handouts. Somehow, after all those potatoes, we managed to eat dessert — Tarte Tatin for Sally, chocolate mousse for me — and we lingered over our remaining 2002 Chateauneuf-du-Pape and decaf espresso. It was pelting rain outside, and we were hoping for a respite so we could dash back to our hotel, which was only a few blocks away. This entry was posted in Dining, Travel and tagged Paris. Bookmark the permalink. You are making me very hungry for mashed potatoes – even the non-French kind! What an awesome experience – thanks for blogging about it!